How Would You Manage a Radial Nerve Palsy Associated With a Humeral Shaft Fracture in the Dominant Arm of a 25-Year-Old? The radial nerve has an intricate relationship with the humerus. From its origin in the posterior cord of the brachial plexus, the radial nerve enters the triangular interval with the profunda brachii artery, bounded by long and lateral heads of the triceps and the teres major. It is closely associated with the shaft of the humerus and is found adjacent to the mid-portion of the bone in the spiral grove. The nerve traverses the intermuscular septum, and is found distally between the brachialis and the brachioradialis. Figure 3-1. 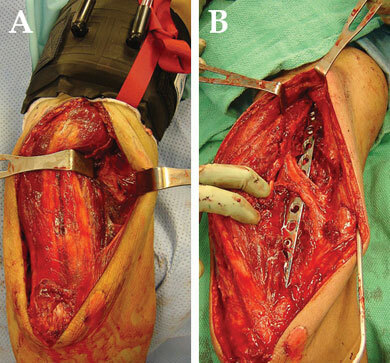 Anterior-posterior (A) and lateral (B) views of a segmental open humerus fracture with an associated radial nerve palsy. Figure 3-2. (A) Intraoperative photograph of a posterior approach to the humerus. The radial nerve is located on the posterior aspect of the intermuscular septum on the lateral side of the arm, between the retractors. The triceps is retracted medially. 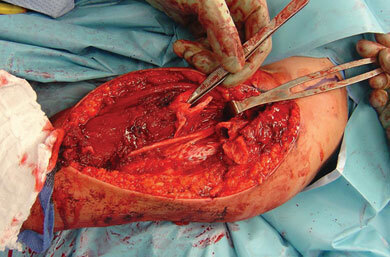 (B) Intraoperative photograph demonstrates the humerus has been exposed, debrided, and stabilized with a plate. The triceps is retracted medially. The radial nerve has been explored and is structurally intact. The radial nerve is demonstrated to be superficial to the plate. Figure 3-3. Anteriorposterior (A) and lateral (B) views of the humerus after skeletal stabilization. The triceps sparing posterior approach provides nearly full access to the humerus and the radial nerve. Figure 3-4. Intraoperative photograph of radial nerve exploration through an anterior approach to the humerus. The radial nerve is demonstrated on the lateral aspect of the arm. It is localized distally between the brachialis and brachioradialis, then dissected proximally. The humerus fragments are retracted anteriorly, exposing the more proximal portion of the radial nerve. The nerve has traumatic laceration of a few fascicles at the fracture site. In closed humerus fractures, characteristics of the patient, the limb, and the injury influence whether operative stabilization or fracture brace treatment will be utilized to treat the skeletal injury. I don’t think radial nerve palsy alone is an indication for surgical treatment of a humerus fracture that would otherwise be treated with a fracture brace. During observation of a radial nerve palsy, I place the wrist in a simple splint. Active finger and thumb flexion are encouraged, and passive stretching should be performed routinely. Splinting of the fingers in extension at rest may be helpful in some patients. Since most radial nerve injuries associated with a closed fracture recover, at what point should further investigation or procedures be performed for those with no recovery? The first signs of radial nerve recovery can take longer than 6 months and complete recovery can take 2 years or more.3,5 Shao et al1 reported the mean time to the onset of spontaneous recovery was 7.3 weeks, which may indicate the minimum waiting time before exploration. The optimal time of observation before intervention has been debated, but no clear answer is universally supported. Nerve conduction velocities and electromyography are often used to look for radial nerve recovery when none is clinically apparent. Negative electrical studies, however, cannot distinguish between a severed nerve and a nonfunctioning intact nerve.3 Results from electrical studies parallel clinical findings. Electrical signs of recovery occur no more than a month before recovery becomes apparent clinically.3,5 Therefore, I usually don’t order electrical studies unless the patient is 4 to 6 months from injury with no sign of recovery. Nerve exploration, neurolysis, and grafting have been performed in attempts to restore radial nerve function. Variation exists in the reported time thresholds for exploration and recovery rates.1 Nerve exploration for possible grafting may be most appropriate in patients who can tolerate a wrist brace, long recovery periods, and an uncertain outcome.3 I reserve this for patients 6 to 12 months from injury with no signs of recovery. For patients where radial nerve function has not recovered, tendon transfers provide predictably good restoration of hand function, but cannot restore fine independent finger extension.3 Recommendations vary on the clinical situations that should lead to tendon transfers. Persistent palsy after an extended recovery period, persistent palsy after neurolysis or grafting, and patients who want rapid return of function or limited surgical intervention are reasonable candidates for tendon transfers. Timing is usually at least a year from injury to allow for possible recovery. 1. Shao YC, Harwood P, Grotz MRW, Limb D, Giannoudis PV. Radial nerve palsy associated with fractures of the humerus. a systematic review. J Bone Joint Surg. 2005;87B:1647-1652. 2. Ekholm R, Adami J, Tidermark J, Hansson K, Tornkvist H, Ponzer S. Fractures of the shaft of the humerus. an epidemiological study of 401 fractures. J Bone Joint Surg. 2006;88B:1469-1473. 3. Ring D, Chin K, Jupiter JB. 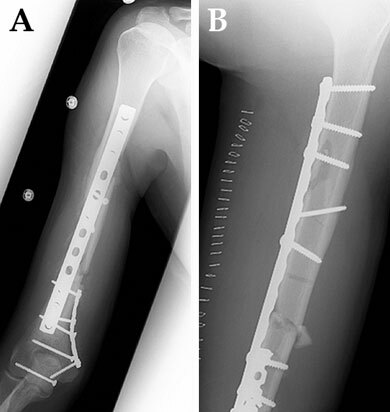 Radial nerve palsy associated with high-energy humeral shaft fractures. J Hand Surg. 2004;29:144-147. 4. Fister RJ, Swiontkowski MF, Bach AW, Sack JT. Radial nerve palsy caused by open humeral shaft fractures. J Hand Surg. 1993;18A:121-124. 5. Shah JJ, Bhatti NA. 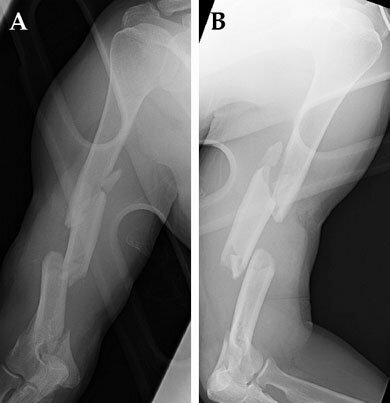 Radial nerve paralysis associated with fractures of the humerus: a review of 62 cases. Clin Orthop. 1983;172:171-176.